Ricoh Europe (Netherlands) B.V. Semiconductor Support Centre has launched the RP118, a 100mA, ultra-low consumption LDO (low-dropout) regulator in smallest possible packages for the IoT market and portable devices. Benefiting in particular from a current consumption of just 0.2µA at no-load and a standby current of 0.002µA are those applications that are mainly in sleep mode and resume for a periodical brief moment to perform a task. 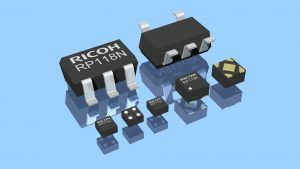 The ultra-low current consumption of the RP118 extends the battery lifetime of wireless devices with RF transmitters (BLE, Zigbee, WiSun, Ant), low power CPUs, sensors and energy harvesting circuits. The device switches automatically between the low power consumption mode and the fast transient response mode, based on the output current demand of the application. The off mode can be achieved by controlling the Chip Enable pin. The performance of the LDO is enhanced in fast transient response mode. In particular, the ripple rejection as well as the response speed to line and load transients demonstrate better results than a conventional low current consumption LDO (refer to the datasheet for specific details). This means the RP118 contributes to optimised output voltage stability and ripple reduction. The RP118 features an embedded fold back current limit circuit. When a short circuit occurs, this circuit contributes to the decrease of the output current to the level of 50mA, thus protecting the LDO and other electronic parts from possible damage. Optional is an auto-discharge function that enables a fast discharge of the output capacitor when the LDO switches off. The RP118 is available in three package options, including standard SOT23-5, small DFN (PLP)1010-4 and ultra-small 0.64 mm x 0.64 mm WLCSP-4-P8 package, which minimizes PCB area.